Since the last month of the year often feels like one big party, there’s no reason your attire shouldn’t match its festive vibe. 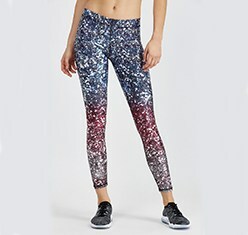 Enter sparkly leggings. It’s like the evolution of the shiny tights trends from a few seasons ago on steroids. Or, if you need another visual, think about when you were a kid making holiday decorations, which basically involved pouring glue onto paper then pouring glitter all over it. Except this time, the glitter is Swarovski crystals and the paper is a pair of Ultracor leggings. Yep, the luxe West Coast activewear brand’s taken its signature star-print tights to the next level. But it’s not alone. 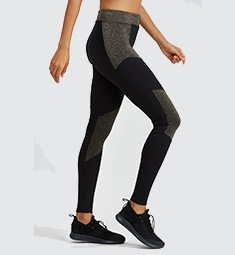 Body Language’s Sculpt Leggings, which come in a glittery bronze colorway, flew off shelves earlier this fall at New York City’s buzzy active fashion boutique Bandier. (They’re finally back in stock, BTW.) And even bigger brands like Nike are adding a little sparkle to their signature styles this season. While some are actually bedazzled, others only give the illusion of shimmer thanks to the trompe l’oeil effect of digital printing (in case you don’t want to spend all winter vacuuming glitter off your car seat or couch). In terms of styling, you can dress your disco pants down after class with a cozy sweater or go in on the OTT trend with an equally “extra” third piece like a pink faux-fur coat. You can easily finish the look with a simple-yet-stylish pair of black or white sneakers day or night—with legs this fancy, heels are definitely optional. Add some sparkle to your step by shopping the holiday perfect picks below. 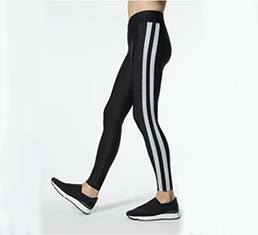 If statement leggings are your jam, check out these new couture-inspired styles from Lululemon. Then, finish the look with an chic jacket, cozy blanket scarf, and winter-perfect boots.